The term “big data” refers to a platform in which vast amounts of data; structured, unstructured and semi-structured can be injected and stored across a highly distributed and scalable system enabling optimal parallelism and scalability. Big data is usually described by the “3V’s” model: high volume, high velocity and high variety. As technology for the platform expands and capabilities for analyzing the data mature, a “4V” model which now includes “high value” has evolved; the ability to unlock additional operational and business value out of this data. Today, TrackWise Analytics brings embedded analytical capabilities to enterprise quality management solutions (EQMS) allowing companies to unlock the value of quality data. So, what role does big data play in gaining an even deeper level of insight? Enterprises are starting to realize that by combining data from disparate data sources into a centralized big data repository they will gain a level of insight that was previously unachievable. Think about the questions you could answer if you were able to correlate data from multiple manufacturing systems along with EQMS data to determine trends, quality metrics or root causal factors. Enterprises are beginning to leverage the analytical capabilities provided as part of big data platforms. The need to capture data from multiple systems and push it to a centralized repository allows organizations to analyze all of the information instead of working with siloed data repositories. Combining the data, performing analysis and being able to correlate the results back to individual systems or processes is paving the way for better insights and improved operational efficiency. TrackWise Analytics can analyze the data that exists in your EQMS. 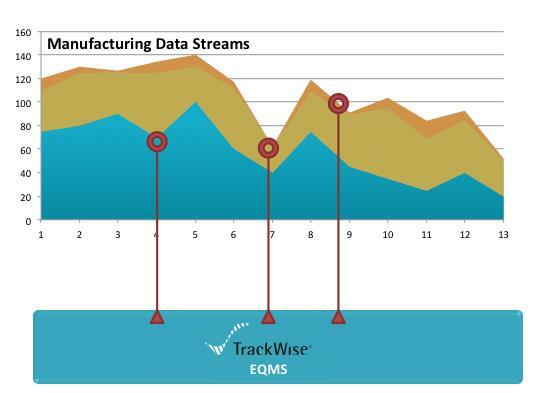 Since TrackWise also provides the mechanism for injecting your EQMS data into a big data ecosystem, you can quickly move to the next level of data analytics thus enhancing the value of your quality data to the enterprise. In 2015, it is predicted that $16.9 billion will be spent on big data and analytics (http://www.cloudcomputing-news.net/blog-hub/2012/apr/10/why-big-data-applications-adoption-is-accelerating), validating the need for TrackWise Analytics to improve visibility and transparency within enterprise quality management systems. At Sparta, we believe that an enterprise quality management system has a very important role in providing data into the overall analysis process. A flexible, configurable solution that provides an intuitive, straightforward set of interfaces to inject and extract data will not only provide operational advantages, but a competitive advantage by being able to predict operational issues or business opportunities. In the example below, streams of data from manufacturing equipment can be loaded into a big data analytics process to find operational efficiencies and manufacturing anomalies. By correlating the results of that analysis with the data from an EQMS, end-users have access to information detailing risk and compliance issues, product issues and the foundation to predicting trends into the future. TrackWise Analytics is the first window into increasing the value of data and enabling users to convert insights into action. By injecting EQMS data into a big data initiative, users can unlock valuable trends that drive business decisions that before were simply hidden in the mountain of disjointed data streams.